About a year and a half ago, not long after I started this dusty blog, I wrote about building a compost bin, and wanting to start a veggie garden. It took me quite some time to really get that going, but that project is officially underway. 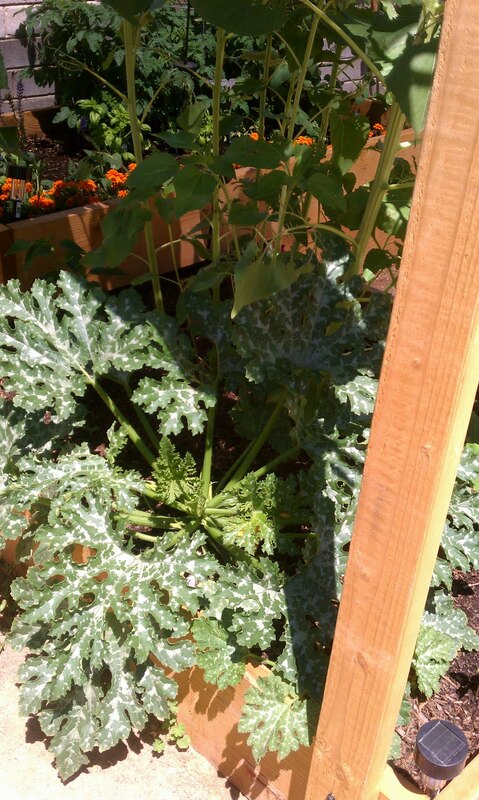 Last winter (2009/10), I planted just a few winter plants: broccoli, cabbage, and brussels sprouts. This past winter, I planted broccoli again, but the deep freeze in February pretty much killed it off. The rainbow chard, I planted, however, apparently took the freeze as a challenge. I put the chard seedings in the ground in November, and now, in June, I still have a regular supply of chard. To be honest, I'm a little sick of chard, and so are my friends. I learned my lesson not to plant quite so much next time. It IS a beautiful plant, though. This past March, I decided to expand the garden, to start moving toward growing enough veggies that my grocery bills start to shrink. 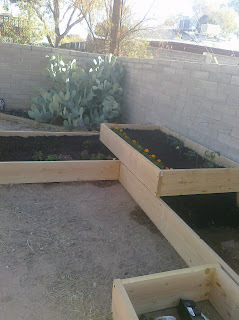 After reading a great book, called Extreme Gardening (by Dave Owens) I planned my spring/ early summer raised bed garden. I found this book to be extraordinarily helpful- a must-have for any desert gardener. I built three large boxes, and one small one, all filled with compost, and composted mulch. I planted the first two boxes on March 27 or so. From seed: zucchini, butternut squash, melon (HoneyGirl hybrid), radishes, sunflowers, nasturtium, carrots, basil, dill. The last two boxes were planted at the end of April. I wasn't as impressed with the transplants from Home Depot as I was with those planted from seed. So, this time it was all from seed: more zucchini, 2 varieties of yellow squash, bush beans, cucumbers, cilantro, dill, more sunflowers, chiltepin (a native pepper plant), and thyme. Now, just a bit more than 60 days after the first planting, I've had a regular supply of veggies, supplementing my deliveries from Matt's Organics. The radishes were fantastic- and I can't wait to plant more varieties at the end of the summer. The first zucchini has been making the most delicious, small, sweet, and crunchy zucchinis. My favorite preparation has been to sautee it, with just a pinch of fennel pollen and black pepper. mmmm. Tasty. The cherry tomato plants are doing great, though very few have actually made it in the house. 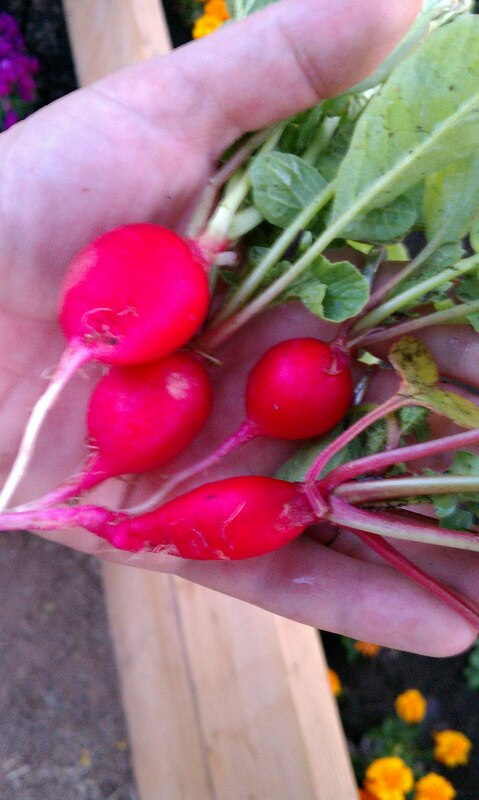 We eat them right out of the garden. I'll write more on the garden as it continues to develop. This long post brings you up to speed on this little project. I have big plans for this garden- namely, to build 3 or so more areas like this one, so I have a set of raised boxes for each season. Fruit trees are in the plans too. I'm a little garden-obsessed these days. This is pretty fun. Home grown food, great bug-watching... it's hard to go wrong!